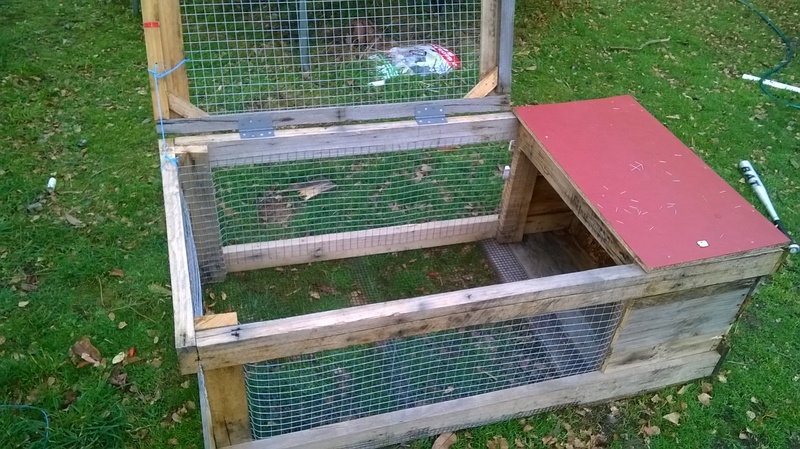 It has been many months in the making, yet I can now happily say that I have completed building my new Rabbit Hutch. I have put off finishing it as i have had other projects, I couldn’t afford some of the materials that I needed, that I didn’t have to rush the job as I didn’t have a male rabbit to put into the structure. Despite all this, I have finished it and I must say, I think it is my best attempt yet at a Rabbit Hutch. This hutch features a much stronger wire mesh, a more water proof design, as well as an addition to prevent the lid from falling back and damaging the hinges. It is the heaviest one I have built, yet I think that I can manage the weight. Speaking of doing things slowly, I was reminded this morning that I really should take the time to check the Road Weather Alerts before I leave the house. I woke up extra early, and left for work around half an hour before I usually leave. I wanted to take it slow on the drive in to be sure I didn’t have any issues with icy roads, considering the extra cold days we have had. Five minutes after leaving my town, I was driving around 60km/h in a 100 zone, as the road was a bit curvy and I wanted to take it easy (I wasn’t in a rush). The next thing I know, I had lost control of the car and was heading towards the left side of the road (which has a steep embankment), I immediately steered into the slide on the left till the wheels caught their grip again, as I had been trained to do. I then had to turn to the right quickly or I would go off the road and into the valley. Suddenly, my car spins to the right and does a 420 degree turn. I spun all the way around and then ended up facing the right, 90 degrees to side. While this was happening, a car was driving towards be and now that I was in the middle of the road, it was headed right at me. I could hear the car breaking on the ice and it ended up stopping 2 meters from my bonnet. I had to sit there and think for a couple of seconds to be sure I was OK and that I hadn’t hit anything, before reversing enough to let the car past. I then straightened up and continued on my way. I had hit what is called “Black Ice“. It is ice that you can’t see on the road and you can’t do much about it once you hit it. I was pretty lucky to get away totally unscathed, which was the opposite to a man I encountered once I parked in the city. The icy side walks were very hard to navigate in the freezing cold pre-dawn. i had to concentrate hard on where I walked to ensure I didn’t slip over. As I walked, I saw a man collapse on the side of the road around 20 meters in front of me. I rushed over as fast as I could with the icy conditions. The man was on the road and I was worried he would be hit by a car. I offered to help him up, but he said he was OK, just winded. After a minute of gathering himself he managed to pick himself up (he refused to accept my outstretched hand), so I picked up all his belongings for him and handed them over once he was OK. I offered to call someone for him, but he insisted that he was going to be fine… I think he was too embarrassed to accept help.